MATLAB is also a powerful programming language, as well as an interactive computational environment. If you use Matlab command prompt, MATLAB also allows you to write series of commands into a file and execute the file as complete unit, like writing a function and calling it. Scripts − script files are program files with .m extension. In these files, you write series of commands, which you want to execute together. Scripts do not accept inputs and do not return any outputs. They operate on data in the workspace. Functions − functions files are also program files with .m extension. Functions can accept inputs and return outputs. Internal variables are local to the function. You can use the MATLAB editor or any other text editor to create your .mfiles. In this section, we will decide the script files. A script file contains multiple sequential lines of MATLAB commands and function calls. You can run with a script by typing its name at the command line. 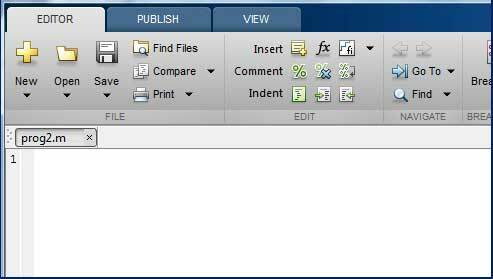 The above command will create the file in default MATLAB directory. If you want to store all program files in a specific folder, then you will have to provide the entire path. If you are creating the file for first time, MATLAB prompts you to confirm it. Click Yes. Alternatively, if you are using the IDE, choose NEW -> Script. This also opens the editor and creates a file named Untitled. You can name and save the file after typing the code.